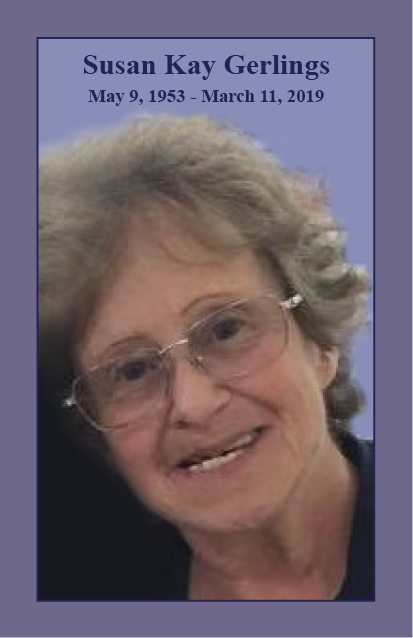 Susan K. Gerlings, 65, of Aurora, CO, was united with her Beloved Husband on March 11, 2019. Sister-in-Law of Cathy (Dan) Grove of Longmont, CO, Todd (Lisa) Gerlings of Westminster, CO and Grant Gerlings of Scottsdale, AZ. Daughter-in-Law of Marion Gerlings of Mesa, AZ. Also survived by 9 nieces and nephews and 21 great nieces and nephews. A Memorial Service will be held at 3:00 p.m. on Friday, April 5, 2019 at the PACE Center in Parker.